Destructoid review: Teenage Zombies: Invasion of the Alien Brain Thingys! There may be a lot of invigorating experiences in life, but we can only imagine what life would be like shambling around eating brains for substance and never being responsible for any boring tea party conversations beyond "guhhhhh." I think I might kind of like it, but I've never been a model of poise and good behavior anyway. 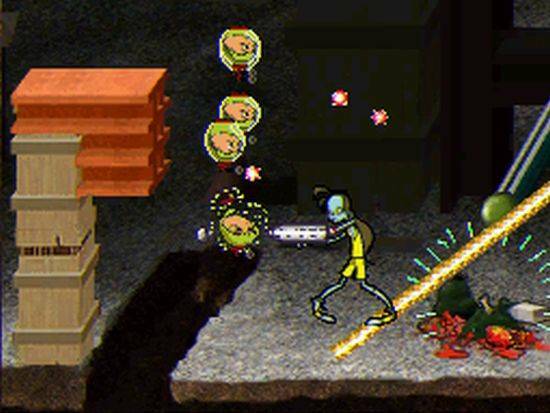 In Teenage Zombies: Invasion of the Alien Brain Thingys!, living life as a young zombie (or three) is as easy as powering your DS on -- you'll be tearing brains out through enemies' ears in no time. You may find yourself wondering if it's fun to mutilate and scuffle about for the duration of an entire game, however, and I can answer that very question for you, among others (although I will not answer any questions about how to use decaying body parts in meal planning). Hit the jump for the skinny on this side-scroller. 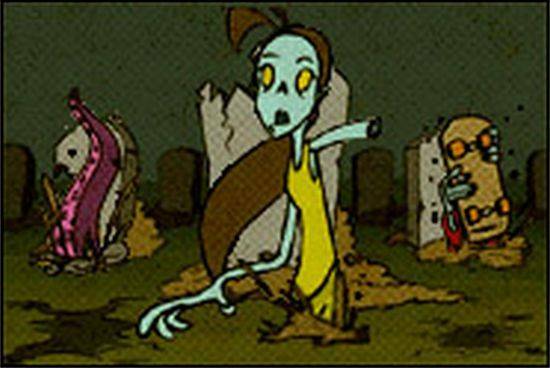 Teenage Zombies opens up in a way that will poke your soft spot if you've ever loved comic books or old horror movies: you will find yourself turning your DS sideways to watch a humorous execution of the setup of the game's story, complete with dramatic narration and stylish art panels. I can't say I wasn't impressed; this seemed like just the sort of schlocky fun the DS seems so ideally suited for. The story is the earth has fallen under attack by some ... erm ... brain thingys, leaving humans helpless in their wake and pointing to the surefire end of everything as we know it. However, a graveyard disturbed in the invasion yields a trio of young zombies: Finnigan "Fins" Magee, Lori "Lefty" Lopez and Zach "Halfpipe" Boyd, all of them possessed with special talents, which will later allow you to skateboard over and puke on your enemies. There isn't enough puking on bad guys in games, if you ask me, so bravo to that. Okay, so you eat brains. What's next? 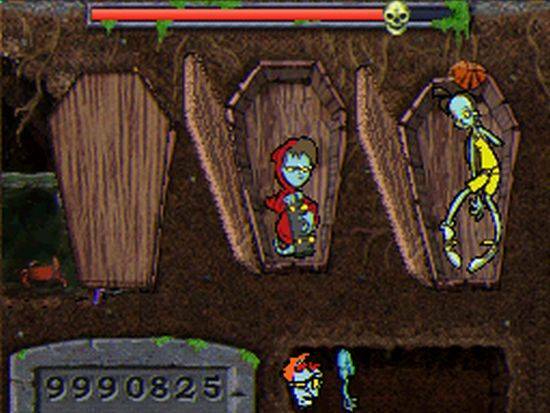 The game opens by introducing you to your three zombies and their powers, which you will need at certain points in the game in order to progress. Your party is displayed at all times on the bottom half of the screen in their coffins, which you tap in order to change to the zombie you want. The display is cute and definitely falls in with the quirky art style, and I liked having my undead arsenal laid out before me at all times. Lefty is basically your girl when it comes to ascending platforms, as she has a long arm that allows her to pull herself up to any nearby surface. Halfpipe is great for squeezing through small spaces and certain types of jumps (he comes equipped with his trusty skateboard). My favorite of the game is Fins, a plump blue fellow with a back full of purple tentacles, which he uses to scale walls and slide down ropes and such. I liked all the characters, but the sound of Fins slithering up a wall just never got old. In addition to progressing through the main story, there are several mini-games that you can play in the game as well (these are unlocked through normal gameplay but can later be played through the main menu at anytime.) One ongoing mini-game has you collecting body parts so you can reassemble the leftovers, while other are indicated on your map by a stylus symbol. You can replay these any number of times after you first encounter them as well, so if you don't quite get it the first time you stumble on one, no worries -- you'll live to puzzle again. For the most part, the game's controls are simple and intuitive, and I liked the ease of switching between zombies. The only thing I found a little annoying was that Lefty has to be in a very specific position to be able to grab the surface she is trying to climb onto, and I sometimes found myself jamming the button trying to get her to find a handhold. Beyond that, I really can't complain -- it's a perfectly simple game to pick up and play immediately, which I appreciate considering many games no longer offer that or make you wait through long intros before you get to touch a button. It bugged me that there was so much about this game that got it right, but it was ultimately too pulled down by super-linear level design for me to love it to the end. For retro fans, the levels may recall beloved games of their past, so it may not faze everyone, but if you are used to playing more complex titles, Teenage Zombies may leave you hungry for more. At any rate, the clever art and pick-up-and-play action is definitely worth some of your time, even if it doesn't warrant your interest all the way to the finish.